Slow-Poke Duck was outside one very warm summer day. It was so warm that he had beads of sweat on his feathers. For anyone else, going for a swim was a very easy thing to do. However, for Slow-Poke, it did take him a little while to get to the pond because Slow-Poke walked a lot slower than other animals. 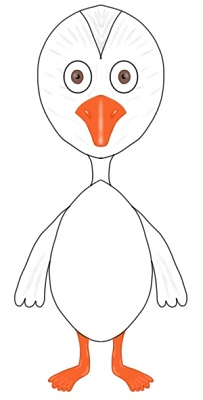 Sometimes Freddy Goose would just go swimming without him because he would get tired of waiting for him. Mother talked to Mr. Jones that afternoon and he said that he would not mind that at all. He said he could even drive him back home after the swim. Mr. Jones picked Slow-Poke up every day and then drove him back home. He enjoyed the company. He and Slow-Poke became very good friends. “That would be wonderful,” said Mr. Jones, patting Slow-Poke on the head. This entry was posted in Grade 3 Level, Slow-Poke Stories, Summer Stories, Summer Story Challenge 2016 and tagged appreciate, friend, happy, pond, Slow Poke, summer, summer swim, swim, warm. Bookmark the permalink.